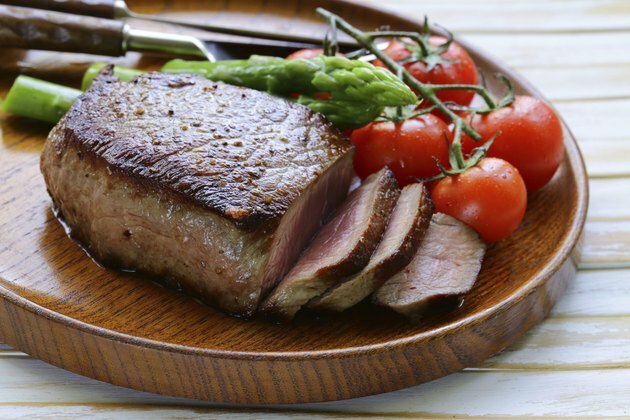 Turning tough cuts of beef into fork-tender meals is possible when you employ the right technique. Celebrity chef Jamie Oliver describes beef taken from the cow's shin to be the toughest, followed by the brisket and eye, or bottom round. Braising and slow roasting are the most effective styles of preparation, as the longer cooking times break down the muscle into tender pieces of beef. The investment of time pays off in the end with fork-tender, intensely flavored meat. Season the roast well with salt and pepper and let stand 30 to 60 minutes. The salt draws the liquid within the beef to the surface, where it reacts with the salt and settles back into the beef. Sear the beef on the stovetop. Browning the meat creates a seal on the exterior of the meat that prevents the meat from drying out quickly. Heat your oil in the pan on high and cook the beef 3 to 4 minutes on each side. Cover the beef with liquid. The amount of water or broth depends on the type of roast and pan. The Cattlemen's Beef Board and National Cattleman's Beef Association recommends that chuck roasts should be partially covered, which could take 2 to 3 cups of liquid in a Dutch oven or braising pan, depending on its depth. Briskets should be submerged, which could take up to 5 cups of liquid, depending on the depth of the pan. Add the vegetables, if you choose to cook with them, cover the pan and place in the oven. Braise the meat for 3 hours, checking the liquid level every hour. The liquid should reduce, but you should not let the pan go dry. Add 1/2 cup of broth or water to the pan if the liquid level reduces by more than half. Remove the roast from the oven when its internal temperature reaches 130 F on an instant-read meat thermometer. Remove the meat from the pan, slice into smaller pieces and serve with the pan juices. Salt the roast one day ahead. Salting the roast will tenderize the meat and trap the natural juices inside of the roast. Set the roast in a shallow roasting pan and insert into the oven. Roast uncovered for 2 hours or until the internal temperature of the roast reaches 130 F on an instant-read meat thermometer. The low heat cooks the meat evenly without drying out the roast. Remove the roast from the oven and let stand 15 to 20 minutes.